Are you experiencing pain after hours of clicking and pointing your computer mouse? If the problem seems persistent in your case, switching to an ergonomic mouse is the best solution. An ergonomic mouse is different from the ordinary computer mouse. This special form of mouse reduces strain and decreases discomfort that you can feel when using a mouse. This pain and discomfort have something to do with some conditions like carpal tunnel syndrome, tendonitis, and arthritis. The market currently offers a wide selection of ergonomic mouse. While you have almost unlimited choices to choose from when it comes to such type of product, just a few of those products stand out. The Microsoft Sculpt Ergonomic Mouse is one of the best-selling ergonomic mice so far. It has remarkable features that make it suitable for daily use. This review will help you decide if this product is the right choice for you. Microsoft Sculpt Ergonomic Mouse – Who is it for? People who experience pain and discomfort in using the ordinary mouse for hours may benefit from using the Microsoft Sculpt Ergonomic Mouse. The product is also a nice option for people who just want to make a healthier and better choice to avoid experiencing wrist pain after spending several hours using a computer. The Microsoft Sculpt Ergonomic Mouse comes with many great things to offer if you are looking for the best ergonomic mouse. Its main purpose is to encourage more natural wrist and hand postures. That’s possible because this ergonomic mouse has an angled body that will keep your wrist off the surface. Aside from having an angled body, this ergonomic mouse also comes with a shaped thumb scoop. It will help your hand keep its angled position to reduce weight and pressure on your carpal tunnel. Thus, using the Microsoft Sculpt Ergonomic Mouse can help you avoid carpal tunnel syndrome. By using this ergonomic mouse, you don’t need to worry anymore about wrist pain because its design makes moving and pointing easier and more comfortable. Unlike the ordinary mouse, an ergonomic mouse like this one from Microsoft can help you avoid wrist strain and discomfort. If you’re using Windows 8, you can also benefit from the Windows Logo key that exists in this mouse. You can use that to get instant access to the Start Screen. Thus, you don’t need to point the mouse on the left bottom corner of your computer screen. The scroll wheel offers full 4-way scrolling control. This unique feature will let you navigate left and right or up and down. Likewise, the mouse has a Back button for faster navigation. Click this button if you want to go back to the previous page. The Microsoft Sculpt Ergonomic Mouse has a very interesting feature called BlueTrack Technology designed for faster and easier tracking. With this feature, you can easily control and use your device on almost all forms of surfaces. This ergonomic mouse is basically for making documents and internet browsing. But it also works well in gaming. It is a wireless mouse, which is a good thing if you love playing games on your PC. You don’t need to deal with tangled wires anymore. To use the Microsoft Sculpt Ergonomic Mouse, just put two AA alkaline batteries. Use quality batteries to enjoy using this ergonomic mouse within a year. The Microsoft Sculpt Ergonomic Mouse will remind you of the Natural Wireless Laser Mouse 6000, which is no longer available in the market. However, the Microsoft ergonomic mouse is smaller than the latter. Due to its size, people with small hands often enjoy using the Microsoft Sculpt Ergonomic Mouse. The device is easy to use. It’s not hefty, so you can bring it anywhere you go. It is highly recommended to people with carpal tunnel syndrome or any other hand/wrist issues. Advanced Ergonomic Design – it encourages natural wrist and hand postures. Thumb Scoop – it helps to maintain your hand and wrist in their proper positions. Mouse height and angle – this will put your wrist in a more comfortable position to reduce the pressure on the carpal tunnel region. Windows Button – this button allows you to access the Start screen with just one push. 4-Way Scrolling – you can scroll right, left, up and down. This ergonomic mouse will let quickly navigate your projects with efficiency and speed. Back Button – this button lets navigate from pages to pages with ease. Dimensions: the mouse is 3.87 inches long and 2.23 inches wide. The Microsoft Sculpt Ergonomic Mouse is USB 2.0 compatible. You can use it together with Windows 10, Windows 7, Windows 8 Macintosh OX X Versions 10.7, 10.9, and Android version 3.2 and 4.2. Since this ergonomic mouse is small, People with bigger hands will feel a little uncomfortable when they use it. If you are searching for a good ergonomic mouse which promises to help you avoid having a painful wrist, then the Microsoft Sculpt Ergonomic Mouse can be the one you need. This is a great product that can provide both functionality and comfort. More and more users enjoy its relaxing grip and comfy design. 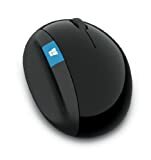 The Microsoft Sculpt Ergonomic Mouse has several handy buttons that make using your computer much easier and convenient. This product comes with advanced features, but some of them may be unavailable on some operating systems. Thus, make sure you check the official website of Microsoft first to learn if you can take advantage of those features or not. When you use this ergonomic mouse, you will never have any problem in controlling or tracking your device and the computer screen. To avoid hassles, just use the mouse only on a smooth, flat surface. It fails to work properly when used on glass or clear surfaces. Thus, make sure you use the mouse on a wooden table. The Microsoft Sculpt Ergonomic Mouse may not be perfect if you can’t use the advanced features it has. Still, its performance and functionality are always unbeatable. Best Ergonomic Mouse Pad with Wrist Support: Buyer’s Guide.